Hello everybody, hope you’re doing marvelously well. Number one, my hair looks bad. The reason why I say that is because there’s always at least one or two comments about how bad my hair looks, so I’m admitting it, it does look bad. I need a hair cut. I need it. And I’m getting it tomorrow morning. But anyway, yes, I’m definitely a mixture of all of that. Now, all joking aside, it’s interesting, because as you know, if you follow me, I work 12 to 15 hours a day, doing the videos, creating courses, and running in the Academy, and also producing and engineering and mixing bands, and artists, and all of that kind of stuff, and somehow or another, I manage to fit in the family, and all kinds of other good stuff. So unfortunately, my hair always seems to take last place, so for all of you that love talking about my hair, I’m very, very sorry, and yes, it is a big mess, but fear not. It’s okay. Tomorrow morning, I’m going to get it cut, and I’m going to get some of this dyed out, this little bit here, so hopefully you’ll be happy again. So, we’ve got another exciting FAQ Friday. That’s frequently asked questions. So, of course, as ever, please, if you’re not already, can you subscribe and hit the notifications bell, and you’ll get notified any time we do a new video! Which is a lot. These days, we’re doing five videos a week. We’re doing live streams and doing all kinds of fun stuff, but of course, we have the Academy, where we do a couple of videos a week, and we do more exclusive stuff in there, and you get free multitracks, and we do mix critiques, and all kinds of fun stuff. There’s so much fun things going on, and we have lots of different courses with like, Richard Furch, and Mark Needham that you can get, you can buy standalone courses, and Bob Marlette, and Ulrich Wild, and Brad Wood, and Cameron Webb with Motorhead, and all kinds of fun stuff. And I’m going to stop talking now and get into Frequently Asked Questions. Is there any specific place on the back of an amp, or just directly opposite of the front of a 57? So this question, just to be clear, is about how I front and back mic amplifiers. Now, I learned this from Dave Jerden and Bryan Carlstrom in the mid-90’s when I was a musician. Well, I’m still a musician. I suppose technically, you’re always a musician once a musician. But anyway, I learned this from them, so Dave, when he was doing those massive guitar sounds, you know, before Bryan even, on the first Alice in Chains record that we did, would take small cabs, like eight inch speakers, 10 inch speakers, and 12 inch speakers, and front and back mic. Now, imagine here’s a speaker. It’s a cone like this. You would put a 57 angled actually close to the cone in the center, but angled into the dust cap in the center I should say, but angled at the actual direction of the speaker, because the speaker was moving forward, you see what he was doing? Then he would put a 57 on the back as well exactly opposite, so the microphones are opposite. So if you choose to do this, whatever you choose to do, the same principle for instance as a top and bottom snare. If you’ve got a snare drum mic that’s coming in on the top of the snare, have the bottom mic, you guessed it, exactly opposite. If they’re opposite each other, they will hear opposite sounds, meaning if a sound wave is going like this, this one’s going to hear it exactly opposite, plus most importantly, that back mic, or that bottom snare, whatever it might be, the back mic on an amp needs to have the polarity reversed, because you can see, the capsule’s pointing this way and that way, they’re pointing opposite each other, so the other mic, the back mic of a cab, the bottom mic of a snare drum, needs to have the polarity reversed, and then you’ll get all of the body. Now, why do we double mic it? We double mic a cab because you get a lot of extra low end, you get a lot of warmth from the back of that cab when it’s an open back cab, so that’s why we mic it. And he would take eight inch speakers, little speakers, double mic it, and get the biggest guitar sounds. Go listen to Alice in Chains, and you’ll know what I mean. Listen to Man in a Box. That [imitates guitar]. That guitar sound is phenomenal. That is a combination of different speakers that he put together to create that sound. Hi, Warren. Where would you high pass on electric guitars? You know, that is a huge question. It seems that high passing is one of the biggest, most debated, misunderstood, misinformed, and disinformed questions on the internet when it comes to mixing. I’ve been in a room with so many amazing mixers. You can name them all. When I look if they’re on an SSL for instance, when I look at their consoles, there’s high passing going on everywhere, but it’s very, very well done, very, very specifically chosen high passing. Remember, high passing on a console like an SSL isn’t this. It’s a little bit of a gentler slope. So when you are high passing, unless you effectively want to reduce something high and low to like, a really, really tiny little thing, you’re really just gently doing it. One of the other things that I see all the time is people looking at waveforms and saying, “Look!” Stop looking at things. Start listening more. That’s what we need, we need to be listening. So if high passing is working for you, however you do it, that is what you should do. So this is a big deal. When it comes to guitars, the answer is, what kind of music are you making? 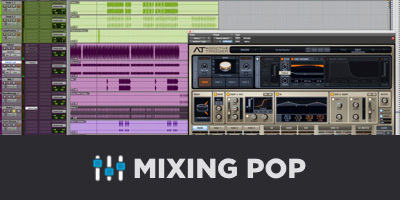 How dense is the mix? The reason why I say that is if I’m doing one electric guitar, bass, and drums, and a vocal, which is a lot of Zeppelin tracks, believe it or not. A lot of Zeppelin tracks have only acoustic instruments. Have only acoustic guitars and barely any electric in them at all. Others have one, two, or three maximum electric guitars playing at all time. So why am I bringing it up? Hey, I’m a Zeppelin fan, so most people are as well. The point is when you have a minimal amount of instruments, you don’t have to high pass as much. Doy! It’s obvious, so there is no rule. If I’ve got a massive bass synth going, [bass synth imitation], this huge bass synth, and I’m putting guitars over the top, guess what? I’m probably going to high pass a bit more aggressively on my electrics, because there’s going to be a cross over of this massive bass synth, and this massive guitar sound. So I’m going to need to high pass a little bit more aggressively on my electric guitar. But if it’s one electric bass and drums, I might let that low end breathe. 60, 80Hz, who cares. Let it cross over on the bass guitar, let it cross over a bit a on the kick. It doesn’t matter, just get rid of the low rumble. It’s okay, because that big fat bottom end is not going to cause as much phase and polarity issues. However, if you’ve got tons and tons of instruments, especially multiple mic’d guitars going on, having four or five instruments aside, all with 60, 80, 100 all going on does not make it bigger, it is not giving you more b-a-l-l-s, as I’ve heard. It doesn’t give you more of that, it gives you more phase and more mud issues than you will ever know what to deal with. You don’t want to leave all of the low end in there, because it doesn’t give you bigger low end, it gives you undefined, messy low end, and the number one thing that I’m hearing from the best mastering engineers in the world is that they’re having problems recently because people have been confused and told not to high pass. It’s all over. There’s all of these videos saying you’re over high passing. Well, no, you’re not over high passing, you just need to high pass very smart. First thing to think about is density of mix. If you’ve got a lot of instruments playing a lot of low end information, you’ve got to get in there and start carving it out and finding details. So really, the answer to that where do you high pass on electric guitar is really, is it the only electric? Is there anything else conflicting down there? Because I think you can safely go to about 80 or 100Hz and do a gentle high pass filter, and still let the bass live in that 80 to 100 area, and your kick drum to live in that 40 to 60. If they’re all gentle slopes, like not this, but nice, gentle — well, for you, looking the other way in the camera, as long as they’re not this and they’re gentle, all you’re doing is getting rid of mud, and you’re gentle carving away. High passing should be that. It should be gentle carving, unless there’s so much low end information going down there, you have to decide to put something down there. Once again, mentioning like, a big, fat, raspy synth that’s going, [imitates synth], it’s eating up. It’s literally like a square wave of super clipped information, and it’s eating up so much low end, that if you try to put a kick in there, and a bass guitar, an electric guitar, it’s just not going to work, it’s just going to be a big blob of low end, so you’ll have to start sculpting things. And that might be sculpting your big fat bass synth. It might be pulling out 60 or 40Hz to let the kick drum in there. It might be using a dynamic EQ. It might be using sidechain compression every time the kick plays. There’s many, many tricks that you can do. However, there’s no law on high passing. I think 80-100 on the guitar gently, electric guitar, gently high passing, is never going to be a huge difference. It’s always going to work, so remember to do it gently. So great question, thank you, and it will always spark a lot of debate. There seems to be a lot of debate on it. I think a lot of people are seizing on a lot of controversial stuff, and it’s not controversial, it’s just logic. Just do it really, really smartly. Think about high passing really, really well, and if you do it really well, really smartly, you’ll get so much more low end. The clarity in your low end then if you don’t high pass. High passing is very important. You just need to do it very smartly. It’s a great question. Warren, what’s your favorite go-to pickup configuration? Humbucker? P90? Strat/Tele single pickups? That’s awesome. Well, hmm… I think it’s a combination. It’s a combo platter. I’ll be honest, I used to be only a Tele guy for years. I used to only like, like, bridge pickup Teles, middle 2 set together, and then neck wise, I would use a tele neck, but as I’ve done more and more sessions, and this is where I really learned, and this is why I highly recommend it. As I’ve done more sessions with top session guitar players like Tim Pierce, obviously, we all know and love Tim Pierce. Check out his channel. I’m sure there’ll be a link here for the channel, etcetera. Tim Pierce uses a lot. A lot of guitar with humbuckers, and I think the reason why he does that — well, A it sounds good, and B, he knows what he’s doing, but the reason why he does that is because I’d rather have more than less of a guitar sound. Meaning if I have a pair of raked guitars on either side, and they’ve given me lots of low lows and high highs, like a humbucker does, I can always sculpt that in my mix. Teles are still possibly one of my favorite guitars, but if I’ve got it at just a really mid-rangey tone, which I do love in certain situations, do not get me wrong, I can’t — I’m sitting there using multiband compressors trying to doll up some low mids that aren’t in that sound, where a Les Paul configuration, a humbucker already gives me that. Now. So it’s a really vague answer, because I’ll defer a lot of the time — I’m going to reach over here — and show you this. This is my main go to recording guitar. It’s got a traditional humbucker Les Paul kind of configuration. I can also change the tone by bringing this up here. It’s a Revstar — it’s a Yamaha Revstar. I use it each and every day on everything that I record. I love it because it’s got a Super Slinky glued neck, and as a couple of rather famous guitar players said to me, it plays like the best Les Paul they’ve ever played. It’s a Japanese made guitar, it’s absolutely beautiful, and it cost $1,500. It doesn’t cost $4,000 like an equivalent Les Paul, but it sounds amazing and it plays like a dream, and it has the Sonotone strings on them we have fallen in love with. So that’s my main go-to guitar. However, when I want that sound, and I want a single pickup going into a Fender Pro Junior for that, “Crang!” If you’re going to do those exciting, [imitates guitar], to kind of push choruses, nothing beats a Fender guitar through a Fender amp. If you want nosey, aggressive, nothing beats a Vox AC15 or AC30 with the single coil, bratty bridge telecaster pickup. That’s the point. These are sounds that are really, really unique. My point is like, meat and potatoes, I tend to favor. It’s not an absolute. It’s not absolute, but I tend to favor humbuckers. Then for personality guitars, I tend to — not always, but tend to — favor single coils, because they can cut over it. However, there is no rules, and remember, there’s a lot more to shaping guitar tones than just using humbuckers or single coils. There’s different amps, different amp emulations and simulations. I just probably find that I’m veering towards the humbuckers a little more. What do you do if the odd bass note is too loud or too quiet? That’s a great, great question. If you watch a lot of the mixing bass videos I’ve done, you’ll notice that I’ll use an R-Bass plugin to boost the low end, and then I’ll also use a multiband compressor. I’ll use the multiband compressor sometimes really subtly sometimes, and sometimes super aggressively. Well, what does that do? Well basically, I take about 250Hz and below, and then compress it evenly, and then turn it back up so it gives me an even 250Hz kind of low end. That’s good, because if we go high, you still feel the warmth of the low end, because even though I’m, [imitates bass] up high here, all of that low end starts to breathe again. So that’s a good trick to use a multiband compressor. Plus of course, with the R-Bass, I get that natural 80Hz that it just happens to default to. It’s fantastic on bass. Now, another plugin that I use on bass all the time and so many people have recommended this too, I’ve done it, is to use the MV2. That’s the MV2. It is one of my favorite plugins, particularly on bass, because it has a low level and a high level function. So if I take those, I can bring them together and suddenly, all of the high notes and the little notes, and the notes that are fretting out and bottoming out get boosted like crazy. Totally changed my bass mixing game. If I were to recommend any one or two plugins for bass in particular, to answer what you’re talking about, I would say R-Bass for low end, and MV2 for evenness. Now, if after those two tricks, you still have notes that disappear, occasional notes, which I doubt, but even if you do, use volume automation. Volume automation will save the day. However, I think most of it will be taken care of with those particular tools. You’ll be absolutely astounded how well they work. What is your everything tube amp? An amp you would choose to record any style or genre? I think my answer is not right, it’s just my answer. [laughs] Okay, this is why I’m not an expert. My everything tube amp, honest answer, the tube amp I use 99% of the time is a JMP. It is a Mark II Marshall JMP from 1978 I believe. It’s a master volume amp, and it sounds fantastic, and I use it 90% of the time when I’m using a tube amp. It’s my personal everything amp. I love it. I think it’s a fantastic amp. Now, what is the session player’s everything amp that I see more often than not? It is a Fender Deluxe 65 or 65 reissue. Some of them come with the original one, some of them come in with the reissue. I see that amplifier on more sessions, when it comes to — not heads, but combos — on more sessions than any other amp. In fact, nearly every session guitar player I’ve worked with, they’ve got one combo in their arsenal. It’s that amplifier. 65 Deluxe, or the Deluxe reissue. Now, I don’t have one. I do have a Pro Junior, which I absolutely love, and I highly recommend. I also have a Carl Martin roadie amp, which is unfreaking believable. It’s a small amp that has a Marshall-ish kind of sound, but I can front and back mic it, because it’s got an open back cab. So that’s a good, great go-to amp for me as well. But session player wise, I’ve seen a 65 Deluxe more often than any other amp ever in the studio from a session guitarist. So that’s more of a lesson of like, what is the typical that most people know how to use and is asked for by producers, and what is it that you know? I know the Marshall JMP. It gets used a lot. That’s the reason it gets used a lot is because I know it, and I know how to get a good sound out of it. So sometimes, it’s better to have gear that you know really, really well than necessarily take the recommendation. If you have a Rev amp or something and you know how to make that sound great, that’s probably better for you than trying to copy something I do, but if you’re starting from scratch, and you want an everything kind of combo that a lot of people use, then I would probably say the Fender Deluxe 65 reissue is the way to go if you want an amp that’s going to fulfill a lot of different kinds of guitar sounds, just because I’ve seen it and used it in so many different situations. Are mixing monitors different from mastering monitors? Yes and no. I’ve been to a lot of mastering studios where they have very expensive monitors, but they’re also the same very expensive monitors that I’ve seen in some, not all, but some very expensive studios where people mix. However, I will say one of the probably best, most exciting experiences I’ve ever had mastering, and this will be true of any of you out there who have experienced this as well, was to have Bob Ludwig master The Fray’s second album. I flew out to Portland, Maine, and I went to gateway and I met Bob, and I sat in a room with him while he mastered The Fray’s second album. We did everything to a DAW. Printed in two tracks and to tape, and every song we listened to the tape, and we listened to the 2-track inside of Pro Tools, and chose which mix we wanted to use the master from. It was a wonderful experience, and I got to hear for these massive, incredible speakers that he had in his room. Bob Ludwig is the mastering engineer’s mastering engineer. Everybody I know that’s a mastering engineer always takes their hat off for Bob. Bob was Frank Zappa’s mastering engineer on many, many records. I rest my case. He told me great stories about working with Zappa that I’ll tell you another day, but why do I talk about this? I talk about this because it was one of the most thorough experiences I’ve ever had. It didn’t feel like I was working with a mastering engineer that had a system, it felt like I was working with a guy who listened to all of the different sources, he was sitting there listening to things making different EQ adjustments from song to song. It wasn’t just like, “Oh, here’s my chain, and this is how it works,” which is a lot of people’s mastering experience. This was very detailed. I felt like I was working with somebody who really, really cared, and really went the extra effort. It was an amazing experience, and we were there the whole day mastering the album. It wasn’t a three hour session, album’s done. This was a long time, and we listened at very low levels. Why am I talking so much about it? Because his speakers were insane. They were huge, they were very expensive, but they were picking up low end that I did not know existed. It wasn’t just like, oh, putting a sub on the bottom of my NS10s, or my Genelecs, or whatever I used to do. This was a case of I had low end that I didn’t know was there that I thought I had high passed out. It was there. It was like rumbling, like 20Hz on a kick drum. It was rumbling 20Hz in an acoustic section, so there must’ve been something left open on the console somewhere, because that was mixed on a 9000, Michael Brauer mixed it on a 9K or 9J, I don’t remember. There was little bits — so we were going in and high passing in different areas, because the last thing you want to do is have a song like You Found Me, a massive song like that, playing through a huge PA at a massive outdoor festival, you know, Never Say Never, “Don’t let me go,” that little breakdown section, and there’s all these low end rumbling. So my long answer is no, not all mastering speakers are created equal. I go to lots of rooms and they have some big PMCs or some big stuff like that, or some big ATCs, and then you go to Bob Ludwigs, and it’s just huge columns of incredible speakers in a room that’s so well acoustically treated that you hear low end that you’ll never hear on those kind of systems that you go in other people’s places, but you’ll hear there because he’s mastering albums to be heard through massive PAs in dance halls, in discos, in clubs, notice I say discos, like anybody calls it a disco anymore. He’s got it dialed in, and I’ve heard things I’ve never heard in any other places. So yes and no. I go to mastering places and they have big ATCs, and I go to Bob’s, and I see these walls of speakers, and I hear low end issues that I’ve not heard in other places. So yes and no. Some mastering houses have more mix orientated speakers, and then some places like Bob’s — and probably other studios. I’m not going to say all studios aren’t like that, but in other studios, you know, mastering engineers should have those kind of environments where they can hear every single low end issue. That is the point of having a mastering engineer. He or she needs to master your music so it can be heard in huge arenas and earbuds. That is the point. That is why they get paid a lot per hour. So here’s a fun one, I’ll end with a fun one. Do I see some new gold and platinum records hanging on the wall? Yes, finally! I have a lot in the house, and we’ve always kept them in the house. Ones that are really important to me, The Fray’s first and second record was a big deal for me. I got some gold and silver records from the UK, but those were the big ones for me, because they were a big career changer for me, so when I got The Fray’s first album went — I think when it went platinum the first time I got a record, when it went double platinum in the US I got another one, and we keep those in the house, because they’re nice to have. It also was great — it’s over there, I don’t know if you can see it in the shop, but the low — the Aerosmith record, there’s a number one’s plaque that Billboard sent, which was really nice to have, to have an album that went into number one, as well as obviously going gold and platinum, so that was really good. But essentially, we started to sort of like, go back and ask for the gold and platinum records for the albums that I’ve done that aren’t already on display in the house, and there’s a James Blunt one there from Some Kind of Trouble, there’s Aerosmith, music from another dimension, there is The Thrills album, Bottle Bohemia, there’s The Fray plaque there. There’s a lot more albums that I need to get. Some are in the house, and maybe we’ll get some to come in here, but it’s just nice to do it. I think for me, I liked having the James Blunt one, because that one’s actually from the UK. It went gold and platinum in a number of countries, but it’s just nice because I was born and raised in England, in the United Kingdom, in Great Britain, to have some of those on the walls. So thanks for noticing. It’s fun to have them and remember working on those records, and yeah, we’ll start accumulating some more. I’ve also got lots of the Grammy nomination slips to get as well, which are kind of fun, but anyway, thanks for that. Have a marvelous time recording and mixing. I really, really appreciate all of these incredible, incredible questions. There’s some more here that I want to address, but they’re actually sparking off videos. So the great thing about these incredible questions that you ask is they give me inspiration to do videos. So thank you for that, have a marvelous time recording and mixing, if you haven’t already, please subscribe. If you haven’t already, check out producelikeapro.com and sign up for the email list. You’ll get a whole bunch of free goodies. There’s drum samples, there’s free — there’s free sessions to mix, there’s loads of free sessions, there’s sessions from Jonah Smith recorded live at Sunset, there’s all kinds of fun stuff. Just sign up, get all of that, and if you want, you can try out The Academy for free for 14 days. You can do it monthly, you can do it yearly, there’s even lifetime memberships. There’s tons of stuff that we do, and it’s only growing day by day. Have a marvelous time recording and mixing, and I’ll see you all again really soon. Oh, with a fresh haircut.